These soft pretzels make a great snack for any occasion. 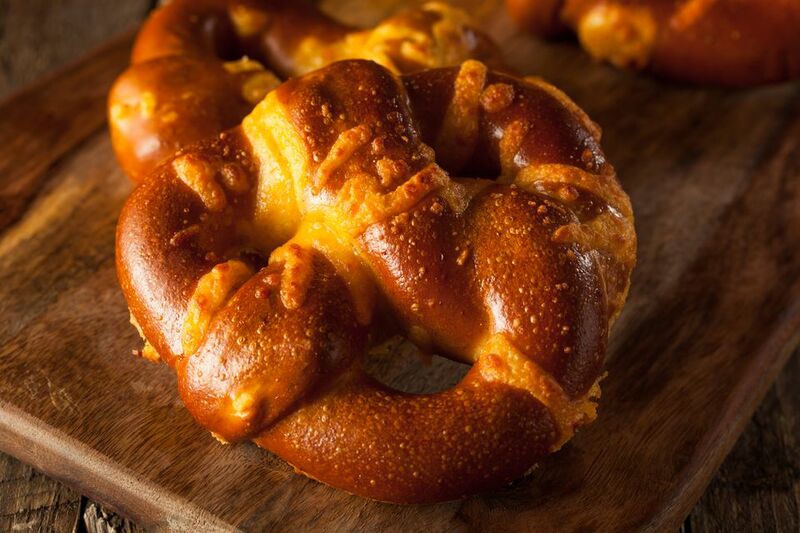 For big mall-style yeast pretzels, take a look at these delicious soft pretzels. Not only are they tasty but they require no yeast to make, which means they're easy and quick! Combine first 4 ingredients in a medium bowl; cut in margarine with a pastry blender until mixture resembles coarse meal. Add cheese and milk, stirring until dry ingredients are just moistened. Turn dough out onto a lightly floured surface and knead about 12 times. Divide dough in half and roll each half into a 12x8-inch rectangle. Cut dough lengthwise into eight 1-inch strips. Twist each into a pretzel shape; brush with beaten egg and sprinkle with coarse salt. Place on lightly greased baking sheets and bake at 400 F for 15 minutes or until golden brown. Cool for a few minutes on wire racks; serve pretzels warm.